Baby shower is a remarkable custom of celebrating the upcoming baby’s birthday and gladdening the expectant mother with a jolly sight of presents. The baby shower should be planned and prepared unforeseen by the mother. The person lucky to win the role of the party creator first charms the favors and preferences of the mother out of her relatives and proceeds to gathering the scenery. 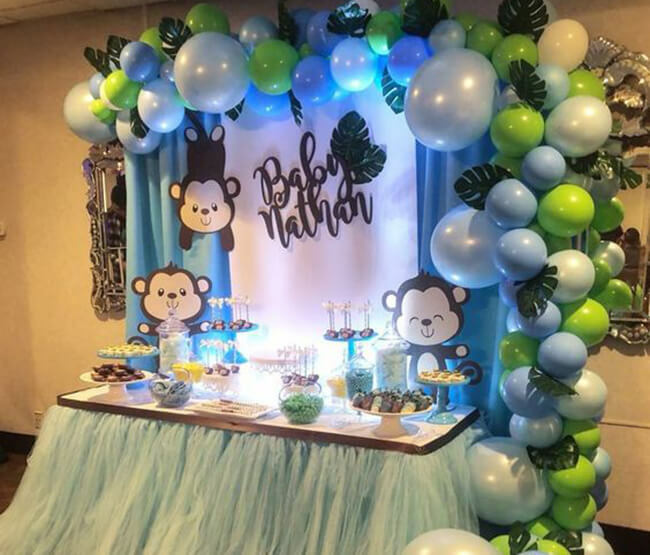 Monkey themed baby shower is a decoration idea that might come in handy. As usual, start with invitations: pastel backgrounds, a picture of several funny monkeys, or that of a banana bunch if you want to add a bit of intrigue. Monkeys are extraordinary in their playfulness, and so should be the print type in the invitations. When selecting monkey themed baby shower decorations, prefer beige, chocolate, yellow, green, blue and ivory colors. All over the place, hang garlands made of cheerful paper monkeys. Attach a small monkey figure that holds a balloon on top of each present and group them for a bright focal point.